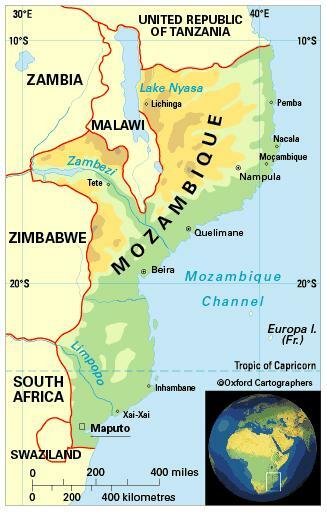 Mozambique is in south-east Africa and borders (anti-clockwise, from north) the United Republic of Tanzania, Malawi, Zambia, Zimbabwe, South Africa, Swaziland and the Indian Ocean. Maputo, Maputo city, Gaza, Inhambane, Manica, Sofala, Zambézia, Tete, Nampula, Niassa and Cabo Delgado. Tropical and subtropical. Inland is cooler than the coast and rainfall higher as the land rises. The hottest and wettest season is October to March. From April to September the coast has warm, mainly dry weather, tempered by sea breezes. The country is vulnerable to cyclones. The most significant environmental issues are desertification, pollution of surface and coastal waters, and persistent migration of people from the hinterland to urban and coastal areas. 25,203,000 (2012); 31 per cent of people live in urban areas and seven per cent in urban agglomerations of more than a million people. The population growth rate stood at 2.8 per cent p.a. between the years 1990 and 2012. In 2012 the birth rate was 39 per 1,000 people (48 in 1970) and life expectancy was 50 years (39 in 1970 and 43 in 1990). Ethnic groups include Makua-Lomwe in the north, Makonde in the far north, Thonga in the southern lowlands, Chopi and Thonga in the Inhambane coastal province, and Shona mainly in the central Manica and Sofala provinces. Mozambique is classified as a low-income economy by the World Bank.